Aside from all the selfies. Every week, I partake in a Sunday night masking ritual. Depending on how my skin is doing, I choose the right maskÂ for the job. If blemishes are my concern, I whip out a clarifying mask (either sheet or the kind from a jar). If the wrinkle in my forehead seems more pronounced than usual, I reach for the one with promised anti-aging benefits. This week though, I was inspired by Posh Spice, er Victoria Beckham. In a recent Instagram post, she shared a snap of herself sporting the EstÃ©e Lauder PowerFoil Mask ($22 for 1 or $79 for 4; nordstrom.com) and sunglasses, as one does. Right off the bat, I could tell this mask was ...Â unusual. From the outside, itÂ resembles a sheet of tin foil, or as my roommate described it, something out of Star Wars. It also comes in two pieces, and the bottom half goes on first,Â likeÂ a metallic beard. Nice. The side that you applyÂ directly to your skin isÂ more likeÂ a typical mask: It's where the hyaluronic acid-based serum (the key hydrating ingredient)Â isÂ infused. As I sat in my bed, waiting for the 10 minutesÂ to tick by, I could feel the mask getting stiffer, which I imagined was the effect of the serum getting absorbed by myÂ skin.Â When my timer went off, the foilÂ seemed to be pulling away from my face, but it wasnât nearly as bad as I have experienced before. 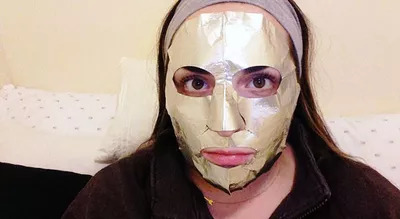 The area around my eyes still fit snug, and that's where I usually find myself pressing down on other masks to make sure no spot goes untreated. I removed each piece and massaged in the remaining serum as instructed. My faceÂ looked and felt refreshed, thoughÂ I wouldn't sayÂ that my skin tone was completely even. (But hey, what mask can work allÂ those miracles after justÂ one application? )Â I was satisfied with the mask'sÂ moisturizing effects, and I think they even held up over night: The next morning, my skin was noticeably smoother andÂ plumped up. For those results,Â I would definitely go full-on Tin ManÂ again.